Displaylite has collaborated with Samsung Electronics to create Spot for MagicINFO, an innovative, engaging, digital signage solution. Powered by the Samsung MagicINFO digital signage package and the Intel® RealSense™ 3D camera, Spot is available as a complete turnkey solution with our ‘EASYSpot’ bundle. The EASYSpot bundle includes a Samsung 49” or 55” display, Intel® RealSense™ 3D camera, Intel® NUC mini PC and the Samsung MagicINFO software package. Using a 3D camera to track and identify user interaction with physical objects, Spot plays relevant digital content on the display creating a personalised experience. 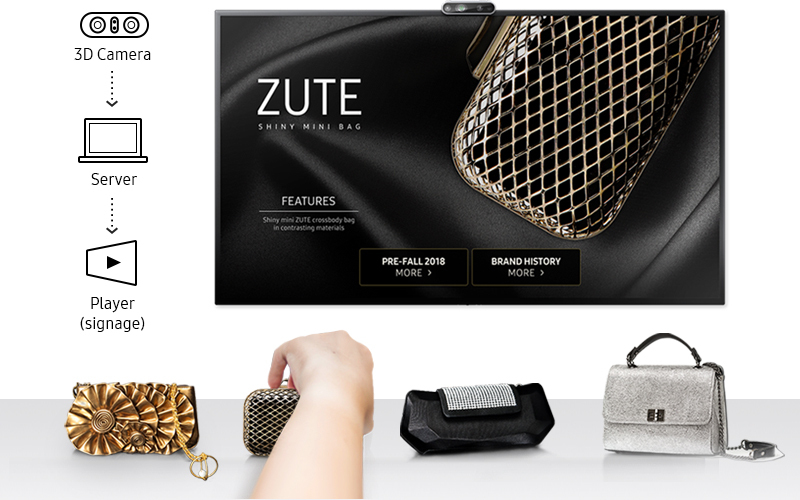 One of the key features of the EASYSpot solution is the ability to easily change physical products and the associated digital content on the display. Popularity of products can be remotely monitored and analysed, allowing you to see how users engage with your products. The solution also supports seamless playback of both FHD and 4K 60fps video content. As part of the EASYSpot bundle, Displaylite also provide a purpose build stand with a shelf for displaying physical products. Find out more about the EASYSpot solution and watch our demonstration video here. Spot is showcased at ISE (Integrated System Europe) 2019 exhibition (5th-8th February 2019, Amsterdam) at the Samsung Electronics booth, 4-S100.